Western Webs were commissioned by Minister Sean Canney TD to develop a website to outline the range of services offered from his constituency office in Tuam County Galway. The website would also present the Press Releases issued by his office on a regular basis. Minister Sean Canney is an Independent TD serving as Minister of State for Natural Resources, Community Affairs and Digital Development since October 2018. Sean Canney has been a TD for the Galway East constituency since 2016. He previously served as Minister of State for the Office of Public Works and Flood Relief from 2016 to 2017. The website content is updated by his constituency office. It is built on a WordPress platform, mobile responsive, optimised for fast loading performance and hosted in Ireland. 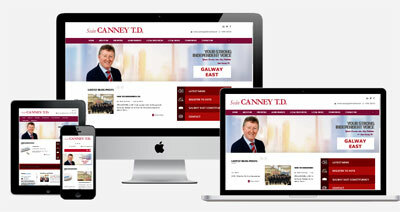 Click to visit Sean Canney TD website.